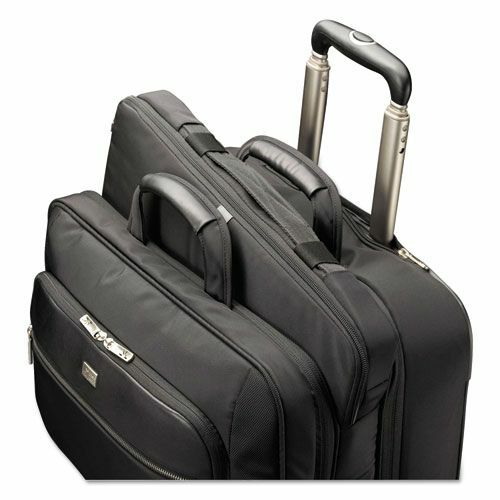 Case Logic 17" Checkpoint Friendly Rolling Laptop Case, 17.9" x 10.6" x 14.8", Black. 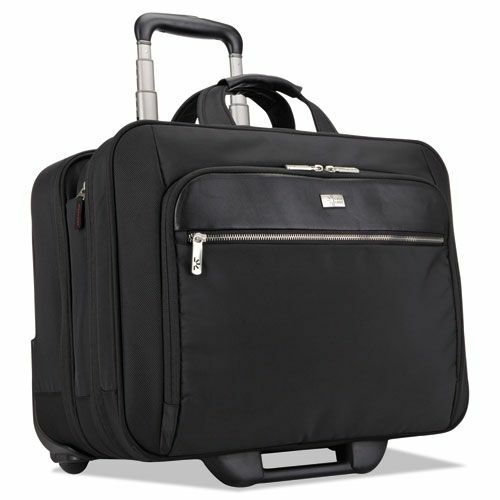 •Executive rolling laptop case compatible with most laptops with a 17" screen. •Designed to be checkpoint friendly so your laptop does not need to be removed when passing through airport security. •Checkpoint friendly laptop sleeve is easily removed from and returned to the case. •Smooth in-line wheels and locking telescoping handle make transporting your luggage a snap. •File compartment stores folders, loose papers and magazines. •Large rear compartment holds a change of clothes for the overnight business trip. •Smart Organization™ panel provides a place for all your electronics, gadgets and accessories. •Luggage strap securely attaches briefcase to most rolling luggage.